Tonight, I am so excited to share with you what hubby has been working on for the last few months in his spare time. Let me preface by saying that we've had our TV hanging on the wall above our fire place since we purchased it about a year ago. And though I liked it there and it fit well, it wasn't exactly what I had in mind. You see, while the TV is on and you're sitting on the sofa curled up in a warm blanket drinking hot tea, you can't have the gas fireplace running. Not only do I use the TV for viewing movies and television shows, but I listen to a lot of music through it. I love our fireplace but would love it more if I could use it! So to solve that problem I was on a mission to find a nice TV stand. After searching online and finding a lot of great furniture options, I realized I didn't really want to spend any money. We had a dresser gifted to my husband years ago that we were planning on selling or donating but I really wanted to find a new use for it since it didn't really match our decor style. 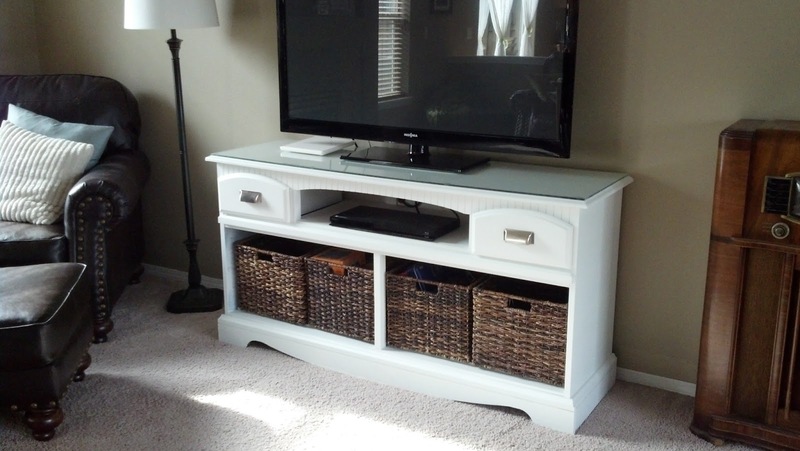 I came across the dresser-turned-TV-stand idea from pinterest and knew it would be perfect! 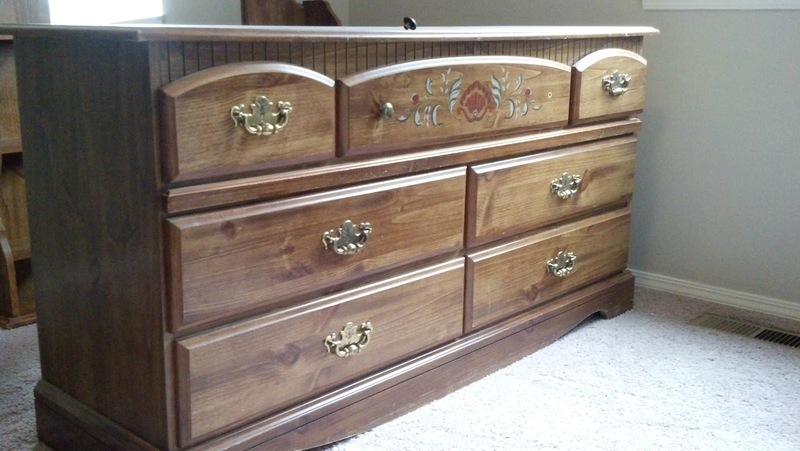 The dresser was made very well and has been incredibly sturdy. Oh, I just love making old things new!! First thing hubby did was take out the drawers and support beams inside the dresser (not shown). 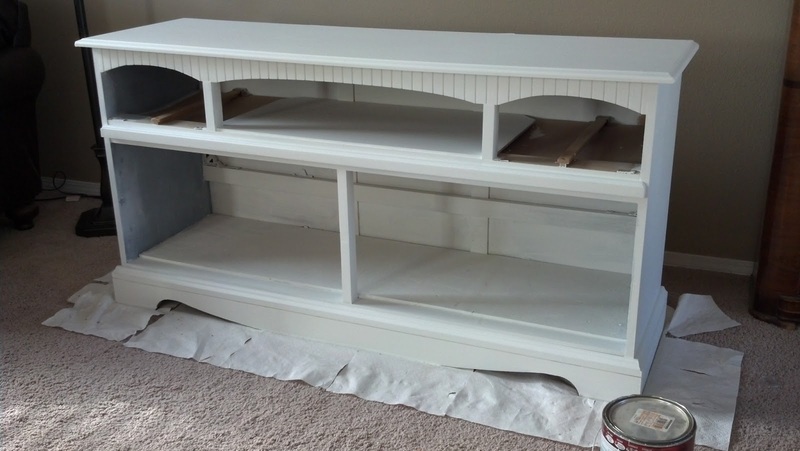 He also cut, painted, and installed a long board (the length of the dresser) for the bottom of the dresser for additional support for the baskets. Long story short...hubby sanded every square inch, primed, and painted...then put on a few coats of paint. He also cut and sanded the glass overlay to protect the top of the stand (using 1/4" plate glass). My job was easy: I went shopping for the drawer pulls and wicker baskets! I also installed the drawer pulls. I couldn't be any happier with the way this "new" TV stand turned out! PAINT: Glidden Interior Paint, White on White tint base, with a flat matte. GL9000 from Home Depot. Couldn't find a link to it on the website. The closest match is here. 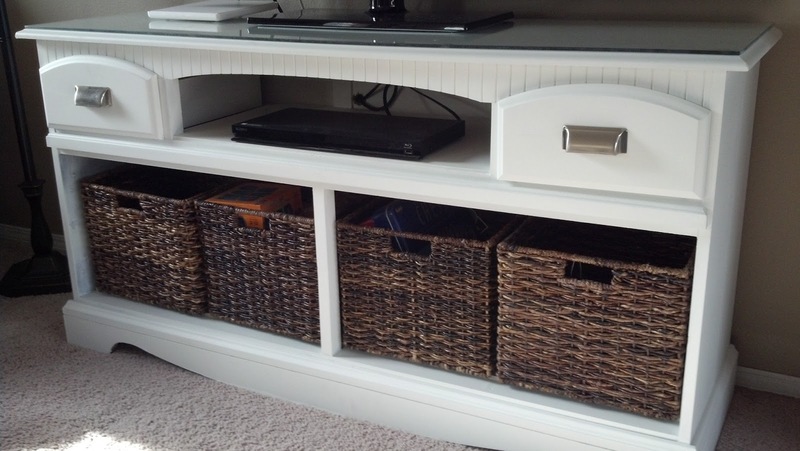 Have you found new uses for old things in your home? Love it! I just picked up a dress on the curb that I want to do something simlar with. Question for you - that part towards the top with all the little ridges - how did your husband sand that part? The one I picked up has lots of detailing like that and I am a bit intimidated by the sanding...any advice would be appreciated. Lookes great!! Oh, thank you so much! On the front top slats, hubby sanded some and then primed and painted. You can actually paint over lacquer (years ago hubby worked in a paint shop) but it is a good idea to buffer first if you can. To save a little time, you could purchase a paint and primer-in-one rather than doing an extra step of painting, then priming. Hope this helps! And thanks again! Hello there! Thanks for checking out the post! Yes, there were supports inside and hubby did use a saw to get them out. Since he surprised me with the start of this project, I didn't get any photos before he took them all out! 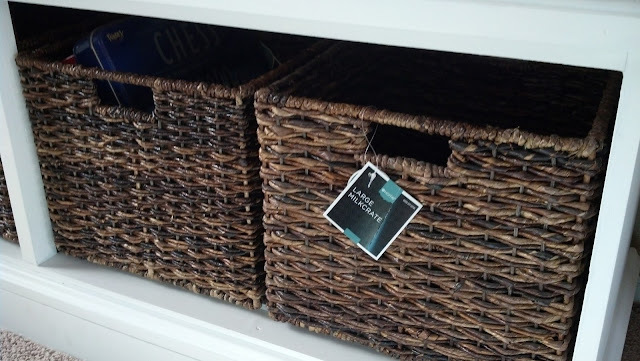 I will need to update the post and include that hubby also installed a board on the bottom of the dresser for additional support for the baskets. Thanks LeighAnne! What are your workout goals? Any specific program you're thinking of? Hitting the gym? I really love what you did here!! Can I ask what type of paint you used? We used Glidden Interior Paint GL 9000. It's a white on white tint base with a flat matte. Thanks for your interest! I would use a satin paint because it cleans much better than a flat paint. I have an almost identical dresser and would LOVE to upgrade it... of course then I'd have to do the other dresser, headboard and 2 bookshelves... :/ But this looks awesome!! Maybe someday I'll feel ambitious! Oh my goodness, yes, doing all of them would be a lot of work! Maybe do them in stages? 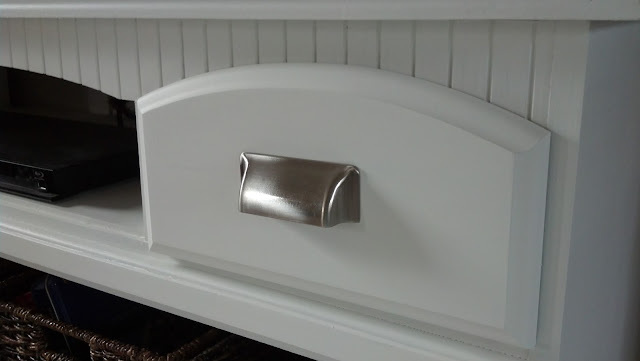 There are so many minimal changes though that you can do to change the look of something...like drawer pulls for example. If you're not on pinterest, you should check it out. So many awesome ideas out there!! Have a great day!! Holy....I still have that whole bedroom suit (from 1983, I think) at my parents house. I am TOTALLY taking it back! You have inspired me. Yay!!!! Was this a laminate finish or stained wood? And if laminate, did you have to work about it peeling away? I have some 1970's girls white and gold French provincial furniture I would love to be able to paint and saw a project online where it had been done but I am afraid to have it bubble or peel away. Love your project and am inspired to use your idea. I would sand it well and prime then paint. I have a laminate sleek topped dresser that Im planning on painting. definitely putting in the work to sand it. Use an oil based paint. Oil based is ideal for furniture. Only draw backs - the stuff smells so its best to paint with it outside, takes longer to dry, and oil based is nearly impossible to paint over in future projects. But it lasts. We painted a real wood dresser, a formica side table, and one of those cheap pressed wood and laminate shelving cabinets with a black oil based paint and we DID NOT sand even one piece! The transformation was beautiful and has lasted over 2 years without nicking, or scratching! We plan on doing the dresser project this weekend (in black) and am completely stoked to get started!! Thanks so much Tiffany! Oh you will have so much fun with all of your projects and nesting! Enjoy your new place! Julie! OMG this transformation is SENSATIONAL! I am loving it! Thank you for giving me a great idea. I have a dresser that is..well..I don't like it much bcoz the drawers get stuck, and I could definitely do this with it. How long did the paint take to dry? Wow, thank you for the kind words! I believe he painted 3 coats and waited an hour or so before starting the next coat. But, we did wait about 48 hours before we put the baskets in just to make sure the paint fully cured (still tacky at 24 hrs). Hope this helps! Great makeover!!! Can't wait to try to find something similar to copy yours! Thanks so much! Thrift stores are your best bet, so many great furniture pieces out there! I love this?? I can't wait till my hubby starts on ours. 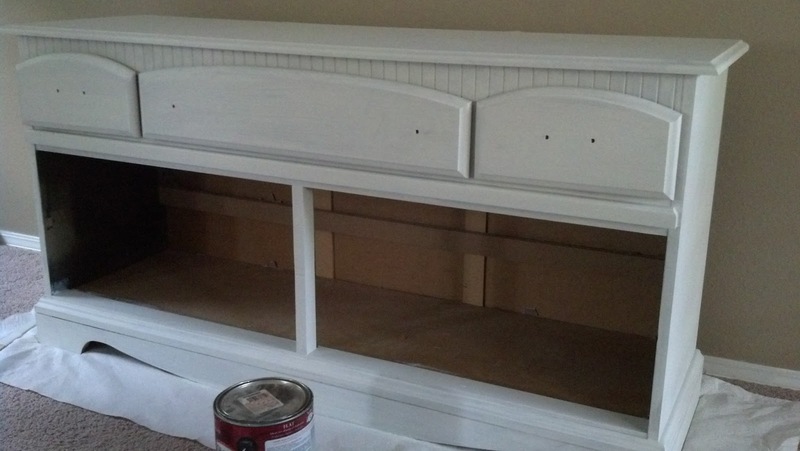 My hubby will be doing this soon to a dresser we have and I wanted to know what did you husband use to paint it? Brush or roller or spray paint. My hubby wants to use spray paint since there is so much detail on the dresser but I think he is lazy. thank you. hahaha. Thanks! We used a brush. If we had a sprayer we probably would have done it that way. He works at a glass shop here in town so it was easy access. He used 1/4" plate glass if that helps. I love this! I found this on a friend's post on FB about Consign Design in Seattle. I just pinned it so I can remember it for the future. Awesome blog entry! This was an awesome idea. I love it! I am so going to do this. I have dresser that would fit perfectly in my living room. Entertainment centers are expensive. I love what you did to this dresser.but I am wondering why you could not use the fireplace and tv at the same time when the tv was hanging on the wall?My tv hangs above my gas fireplace and I use both all the time. Love it! I'm sitting here staring at the dresser I want to do that with. CAN'T WAIT to show this to the hubs. Caught this on FB, btw, from a repurposing-crazy friend, shared on Flipboard. I am so going to do this!! I have an old dresser in the basement that will be perfect for this!! Great idea!!! This is completely awesome! I wish I had the space to do projects like this! You guys rock! LOOKS SPECTACULAR! OH! May I ask what kind of sander your husband used? We have the same old radio!!! Great diy project too! What kind of wood did your husband use as the extra support for the baskets? And how did he put it in there? What size were the boards that your husband put on the bottom to support the wicker baskets? Hi there! I didn't see in your tools list a saw for cutting the wood divider between the bottom shelves and middle shelves. What did your boyfriend use to do this? I love this so much. I'm trying to find a dresser like yours so I can copy it. Thanks! I literally just bought this exact dresser at the thrift store this afternoon! I plan to use it both as a tv stand and as a dresser. So I am going to take out the middle top drawer and possibly the two small ones as well. 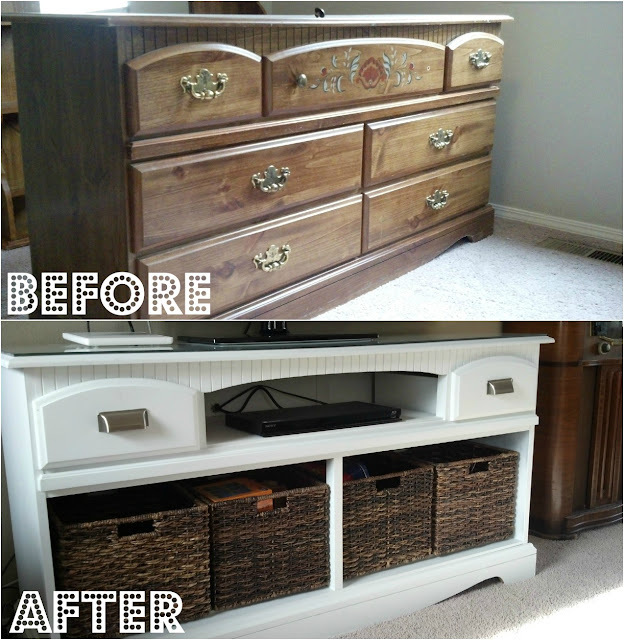 I am so excited to see how somebody else converted this same dresser! I did this with a discarded dining room sideboard. It was quite old, ugly, and had been ultimately used as a garage work table. Someone had glued and nailed vinyl flooring to the top of it to use it as a work bench. I removed the old flooring, sanded the entire piece, and painted it a hot teal color. I actually kept the original pulls as they were kind of interesting and added unique detail. I just painted them the same teal color as the wood. It turned out to be beautiful, if I do say so myself. It's unique, adds a great pop of color to my navy/beige/turquoise room, and was cheap. I bought the sideboard for $10 off craigslist; a few cans of teal spray paint later and I have a cool storage piece for my dining room. i am so excited to try this out, i saw this post and loved it, started to look for a dresser ad never could find one i like. But a week ago i cam across this EXACT dresser for only 20 $ going to start it this week!! We all have that day. The day when our world changed forever. For us, it was the day we lost our little one. I don't cry much anymore, but I remember. The pain isn't raw as it once was, but I will never forget. I remember the day I found out I was pregnant. The day I told my husband he was a daddy to be. I remember the dreams we had for this baby. Our hopes. Our plans. Our future. I remember our normally un-snuggly dog coming up to me and nuzzling her head under my arm pit, resting her head on my belly as if she knew there was a little life growing inside of me. I remember the prayers. So many prayers. We prayed every night for this baby of ours. For their future. For their health. For their life. The unbelievable love. The warmth of the sun and the smell in the air. I remember the darkness descending. The blood. The emergency room. The tests. The feelings of fear. The spoken words. The reality dawning. The unimaginable pain. We all know how expensive Mod Podge is at the craft store, right? And since there are so many projects which use it, I thought I could find a homemade version online. Love pinterest! This is seriously the easiest DIY project I have ever done. Before I made the Mod Podge, I washed out the jar and spray painted the lid silver. I also took off the label from the jar and did my best to get rid of all of the adhesive (first tried a paper towel and rubbing alcohol, but it didn't work and then I tried olive oil and it worked like a charm). Copyright At The Park's 2011-2019. All rights reserved.